Established in Henri Bouchard's studio (25 rue de l'Yvette, Paris, 75016) after the sculptor's death in 1960, this unusual museum attracted thousands of visitor. They were surprised to see a workshop preserved in its original state, containing the considerable work of an artist who was famous in his lifetime as an important representative of sculpted figurative art in the first half of the twentieth century. 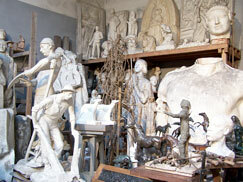 The sculptor's studio was open to the public from 1962 to 2007 and was officially listed as a Musée de France in 1985 by the French Ministry of Culture. The doors were closed for good on March 14 2007 and the collection was transferred to La Piscine museum in Roubaix, where the public will be able to view them again. Its expansion, due to regular temporary exhibitions, reflects a renewed interest in figurative scupture. It is thanks to the artist's son and daughter-in-law that the museum is known. 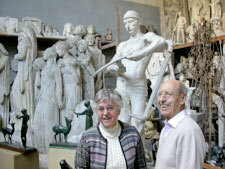 Despite many obstacles, François and Marie Bouchard preserved the premises and the works that were there throughout the 1960s, resisting pressure to sell the studio. Seeking to understand the life and work of Henri Bouchard, they undertook long and extensive research into the various works. Marie Bouchard was awarded a diploma from the Louvre School, and then, with further study, the official title of museum curator. They shared their passion for their subject with the museum's visiting public over nearly forty-five years, communicating their patiently accumulated knowledge of the artist's creations, his evolving style, his place among his peers, and explaining the sculpture techniques used during this period, drawing on the moulds, frames, turntables and tools that had been left in the studio. 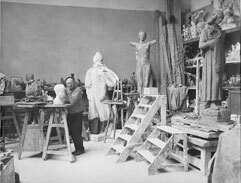 Around 1935, the studio was big enough for the artist to work. But, by 2006, the gradual growth of the collection had made it far too full. 1924 - studio built for Henri Bouchard (1875-1960) in which he produced, among others, the enormous Apollo group and the façade of the chuch of St Pierre de Chaillot. 1960 - death of the artist. Madame Henri Bouchard willingly opens the studio to the public. 1962 - founding of the Association of the Friends of Henri Bouchard, whose aim is to protect and publicise the work of the sculptor. The studio is opened on an informal basis. 1968 - death of Madame Henri Bouchard. 1969 - François Bouchard becomes the owner of the studio, which means the works can be kept. « open on Wednesdays and Saturdays from 2pm until nightfall » (very poor lighting) then from 2pm to 7pm until 2007. 1984 - gift of works from the family to the the Association of the Friends of Henri Bouchard. 1985 - officially listed as a Musée de France by the French Ministry of Culture. Marie Bouchard takes on the role of curator on a voluntary basis, the Association manages the museum. 2006 - the idea of transferring the works from the Musée Bouchard to the Museum of Art and Industry La Piscine in Roubaix is accepted by the Ministry of Culture and becomes official with the minister's signature on 13th December 2006. 1986 à 2007 - about thirty distinctly different exhibitions were oragnised on various subjects and on the evolution of style. This was fortunately possible as Bouchard had been interested in a wide variety of themes, and his style clearly evolved, initially, constructed realism, then calm decorative art and monumental art; he created pieces in every possible format.